Gun massacres occur so often in the United States that we can almost predict our response. First, we are horrified by the scale of the violence and by the efficiency of its planning and execution. Then we begin to feel for the people killed and wounded, their relatives and friends and the communities that will be lastingly marked by it. We then ask why it happened, and move to anger that legislators do not limit access to weapons. Finally, this murder slips from memory to be replaced in due time by another even worse. This cycle of horror, sympathy, outrage, curiosity and forgetfulness prompts reflection on why there is no circuit breaker. And particularly, why is not anger sufficiently focused to restrict access to the tools of murder? The most common explanation appeals to the strength of the National Rifle Association and its capacity to threaten the election of politicians opposed to its policies. This is undoubtedly an important factor, but it is decisive only because people accept its premises: that Americans live in a world peopled with enemies, that they have a right to own weapons, and that they need more powerful weapons than the villains who threaten their lives and property. Guns are not the problem, but people. And bad people needed to be deterred. According to this logic gun massacres do not argue against the right of citizens to be heavily armed but confirm it. The logic of deterrence is rational within a mechanical framework, but when applied to human dealings it becomes irrational. That becomes clearer when we set the stalemate in the United States over the right to possess weapons alongside the conflict with North Korea over the development of nuclear weapons. 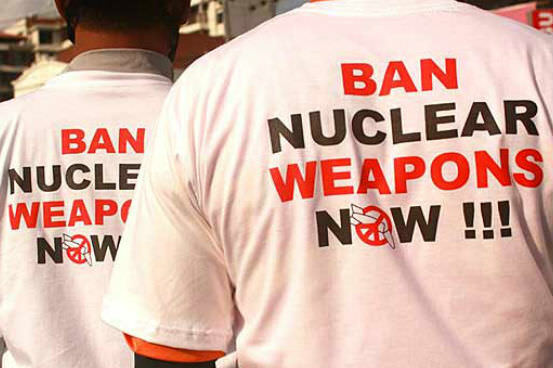 The argument made by the United States and other nuclear powers for the possession of nuclear weapons is that they are necessary to deter potential aggressors. The capacity to use them for mass destruction ensures that they will not be used in practice. Seen from this perspective they are peacemakers. This argument is conceptually neat. But its logic leads to nuclear proliferation. It encourages nations that feel threatened by other states armed with nuclear weapons to develop their own capacity to wage nuclear war. It is not surprising that the rulers of North Korea, having seen the destruction visited on Iraq, Afghanistan, Libya and Syria by various nuclear powers, should believe that their own security and peace depends on the development of nuclear weapons. To guarantee their peace all nations need to be armed to their nuclear teeth, just as in a peace loving society all citizens must be armed to the eyeballs. In fact, of course, nations endowed with nuclear weapons promote a policy of nuclear non-proliferation, which restricts the possession of nuclear weapons to a few dominant powers. This is based on the non-rational assumption that nuclear nations are exceptional in looking benevolently to the interests of all and not simply to their own interests. "All people who go recklessly to war or massacre people with guns believe they are exceptional and are good guys and that their actions are justifiable. The greater their murderousness, the greater their sense of exceptionality." The regular gun massacres and the conflict over North Korea demonstrate that the conceptual rationality of nuclear deterrence and of free access to guns conceals a deep irrationality. It ignores the unpredictability of human behaviour and the influence of non-rational prejudices, such as attributing to our enemies self-interest, resentment and competitiveness while assuming that we are the exceptional good guys in a sea of bad guys. The problem is that all people who go recklessly to war or massacre people with guns believe that they are exceptional and are good guys and that their actions are justifiable. The greater their murderousness, the greater their sense of exceptionality. If they possess nuclear weapons they will be more likely to use them to stop the bad guys developing them, regardless of the cost. If all citizens can own deadly weapons in order to deter their enemies from assaulting them, it is humanly inevitable that apparently good guys will use their cache of weapons on armed and unarmed alike. The human logic of deterrence will then require us to distribute even more powerful weapons to good guys to deter the bad guys, only to suffer the harm we wish to deter. This is to say that the logic of deterrence, particularly when associated with exceptionalism, is self-defeating. A human rationality allows for the likelihood that national leaders and citizens will sometimes act irrationally out of an unjustified conviction of self-righteousness and entitlement. If they have triggers or nuclear buttons to hand the consequences can be catastrophic. The rational policy to pursue both in gun laws and international relationships is one of disarmament. Human rationality also allows for the likelihood that conversation and negotiation will puncture self-righteousness and exceptionalism and will lead to a more peaceful society and world. It is heartening that the Nobel Peace Prize went to an Australian initiated group pressing for nuclear disarmament. It is disheartening, though unsurprising, that the Australian Government did not celebrate its achievement. Down under, deterrence is dogma. It seems that the USA lives in an irrational, celluloid, conspiratorial world created in great part by Hollywood. Jesse James and Billy the Kid ride again !! Years ago, cowboys and Indians was a make-believe game for children. It still is but is now played by immature, paranoid adults with real guns. I have little doubt, from my own reading and understanding of the New Testament, that Jesus was a pacifist. Otherwise he could easily have raised an armed revolt against the Romans and their local collaborators. The result would've been another Masada. Another failed Jewish revolt. I am very cautious about talking about 'God's plan' because I am not privy to that, but, reading between the lines, I don't think Jesus was meant to be a failed revolutionary. He was a revolutionary of a different sort and that revolution changed human history irretrievably. The Resurrection is not just a 'one off' event, because, in a spiritual sense, it is always with us. George Fox, who lived at a time of horrible internecine warfare in England, was inspired to say the big 'No' to violence and war. I think we need to have the guts to do that. Naive? Unrealistic? They said that about Jesus and his spirit lives with us whilst the vicious bastards of his day are giving full account for their deeds. When was the last time a liberal democratic polity which feeds its citizens was invaded? Perhaps Israel in 1973. Countries become the playthings of foreign powers when the rulers of those countries fail to bring unity to their people through a systemic application of the two-pronged commandment: love your God (or some transcending system of ethics) and love your neighbour as yourself. Failed rulers and elites bring about failed states because they allow foreign powers to play divide-and-conquer with their citizens. But, special reasons need to exist to make it worthwhile for foreigners to intervene. Zimbabwe is a failed state, but in no danger of becoming a playground for foreign powers anytime soon. Nobody is making hay with Philippine problems with independence groups. Most of Muslim Africa and the Middle East (except the paranoid rulers of the nation-home of the minority Shia sect) don’t appear to be in any hurry to acquire nuclear weaponry. Why is Vietnam unafraid of the US? The US could never make Kim Jong-un feel threatened if he didn’t already feel threatened by his own people being within sniffing distance of the prosperity of the southern model of governance. Kim/Iran are the authors of nuclear danger. For more than 200 years the West has used its military and economic superiority to attack and control other lesser states confident that it will never have to suffer a counter attack on its own soil. 9/11 changed that. The West is now vulnerable though not yet as vulnerable as those states that it seeks to dominate. Is it any wonder, given the experience of those states who have suffered Western belligerence, that other states who feel at risk should seek to acquire substantial deterrents ?